Last week I had the honor of visiting Adolfo Muñoz at his Adolfo Restaurante in Toledo. Snugly situated in the middle of the city, just barely around the corner from the cathedral, this iconic restaurant has long been an institution in this city, which in turn has lead to more recent offshoots like the modern tapas bar Adolfo Colección, the elegant Viñedos Cigarral Santa María banquet hall and winery that is perched over the city with breathtaking views, and the new restaurant on the top floor of Madrid's restored Palacio de Cibeles (old Post Office), which is run by Adolfo's son Javier. But it is at Adolfo Restaurante where you are most likely to find this gregarious chef stuck into the busy goings-on in the massive, open kitchen, and it is in this building that you can truly feel the essence of this historic city and the treasures that it hides. I first visited this restaurant many year's ago with an Irish friend's delightful grandfather. I remember it as being very classic, both in style and in cuisine, with a lot of old world charm. After a hefty renovation in recent years, the place has a new look that includes the open-kitchen, a rooftop terrace with stunning views of the city, nine hotel rooms, and a menu that features a more seasonal take on traditional cuisine and regional flavors. Though somewhat sleeker than I remembered, the place still has old world charm, particularly thanks to the fact that it occupies a 14th century noble house and has the original, exquisitely restored, painted wood ceilings and columns to prove it. The rest of this charm comes from Adolfo himself, who maintains a level of enthusiasm and energy that is absolutely contagious - especially as he hops around his kitchen. The official objective of my trip was was two-fold. On the one hand, I had to shadow Jeffrey Weiss, a young American chef who had once worked in Adolfo's kitchens as part of the ICEX (Spanish Institute for Foreign Trade) Training Program and who was back in Spain with photographer Nathan Rawlinson to take photographs for his upcoming book on Spanish cured meats. On the other, I wanted to learn how to make perdíz en escabeche (partridge marinated in vinegar), a typical dish from this region for which Adolfo is particularly well-known and about which I happened to be writing an article for Foods From Spain. The unofficial purpose was obvious, I mean who would pass up the chance to jump into the kitchen with a famous chef and learn how to make his special dish? 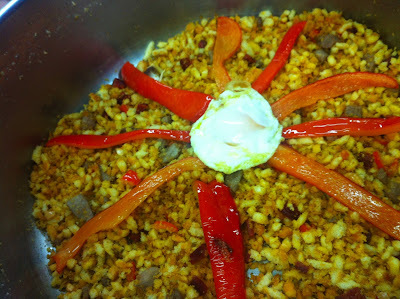 What I wasn't prepared for was the big surprise bonus, which was that Adolfo had also decided to teach us how to make another of the most famous dish's from Castilla-La Mancha: Migas. The delicious Migas made by Adolfo and eaten by me. The starting ingredients for a large pot of migas. Lots of garlic, a few slices of chorizo, some slices of nice lean pork, a red pepper (used as garnish), finely chopped candeal bread crumbs (preferably that someone else has diced), olive oil and sweet Spanish pimentón (paprika). Cut the chorizo into small pieces, smash the garlic with the peel on, cube the pork and slice the pepper to fry separately. Good migas should be slightly damp, but still loose. Prior to preparing this dish, the migas (crumbs) should have been mixed with sweet paprika and a little bit of mineral water, covered with a damp cloth and left in the refrigerator for around 12 hours. Add a little bit of extra virgin olive oil to your beautiful big pot - preferably if you have your own brand of oil as Adolfo does. Add the chorizo, the pork, a bit more water and the smashed garlic cloves and let the whole thing cook for a little while, then add quite a bit more oil at the end and let the whole mixture rest for five or 10 minutes with the heat turned off. Finally, turn the heat back on and add the bread crumbs. Stir the mixture together quickly until the oil turns all the crumbs a lovely golden brown (just a minute or two). They should still be loose and not clumped together. Garnish with the red pepper and a fried egg in the center (and a pinch of salt). Jamón slicing, date-eating Iberian pigs and other reasons to say hot diggity! 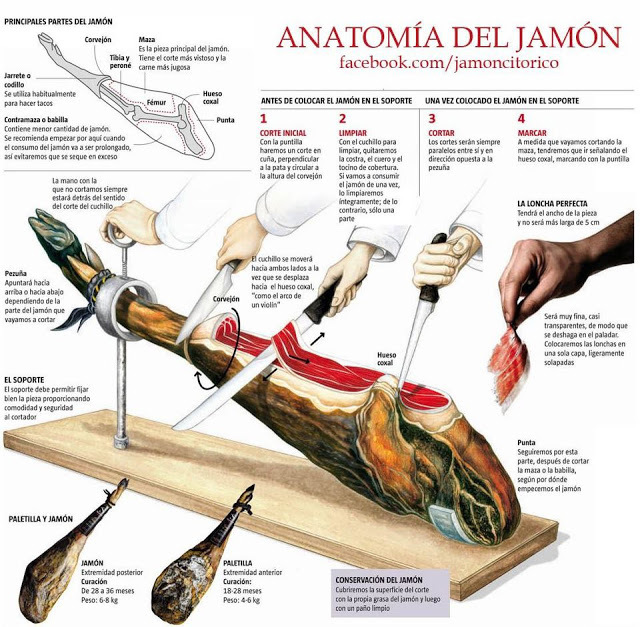 I love this Spanish jamón slicing guide that I got from the blog of my friend Santiago Orts, botanist extraordinaire and co-founder of the amazing company Huerto Gourmet. Though Santiago is known for the incredible and often rare heirloom fruits and vegetables that are found in his orchards in Elche (Alicante), he recently made a foray into the world of Spain’s most delectable treat: JAMÓN (nectar of the gods). At recent gastronomic event Madrid Fusión, Santiago got together with noted Guijuelo (Salamanca) Ibérico ham maker Atanasio Carrasco of Carrasco to present their fascinating new collaboration, the product of three years of experimentation and “research”, which I am sure often came down to getting together and eating a lot of ham. Poor souls. Basically, the new project consisted of raising Iberian pigs on the fresh dates that Santiago’s orchards are so famous for, instead of the usual bellota (acorns). I got to taste the results first hand at Madrid Fusión, biting into the sweet and somewhat creamier textures of first salchichón and then ham made from these pigs. Though the two confessed that there are no immediate plans to retail these products, and also that it costs ten times more for the pigs to eat fresh dates than the coveted acorns, I still find the idea fascinating and more than worthy of an enthusiastic “hot diggity”. With regards to the ham-slicing chart, it is worth a study. In fact, few people realize just how difficult a task it is to slice a ham, and particularly to slice it well. At home, we usually have to watch the same YouTube instructional guide several times before attacking the Christmas jamón, and then after slicing for a few days (very painstaking and tiring work – particularly when you are salivating heavily), we give in and take it to our local market where they slice what is left and put it in vacuum-sealed bags for us. I should point out that I say "we", but I really mean E. What??? It’s called division of labor!